I’ve got to be honest. Every time I hear awesome stories about people that are fans of games getting to work at those studios, I go through a range of emotions. On the one hand I’m insanely jealous and maybe a tad annoyed (SFF fans should understand), but more often than not, I’m just happy that one person gets to live out a really awesome story. Because I’m a human, I love these tales. Take John Beech, who also goes by “johnee” on PSN. A construction worker by trade, John also happened to be an advent map and level creator for Media Molecule’s Little Big Planet, the sprawling sandbox game that allows players to do virtually whatever they can think of. CVG has posted a cool look at Beech’s story, which goes from his time designing maps with a blanket over his head and the TV (so he wouldn’t wake his sleeping girlfriend) to his near-death experience on a construction site, and how it lead to him asking MM for a job… and then getting it. 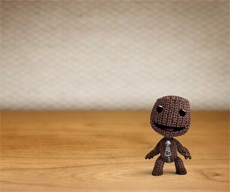 Beech now works as a designer on Little Big Planet 2, and it sounds like he’s totally living the dream. I didn’t even have a CV, and I hadn’t done anything except be a builder my whole life, which they thought was hilarious. Then I loaded up my PlayStation and started showing them one of the things I had done. Anyway, I highly suggest reading it for the “warm fuzzies” factor. Do you guys have a talent that you’d love to turn into a video game job? Personally, I’d love to write stories for someone like Bioware. Man I wished I could be like that. This is crazy! The equivalent of this for me would be building an awesome Forge map and getting hired by Bungie. It wouldn’t happen because I don’t have the patience for Forging, but anyways. Good for this guy. Glad he’s at least broken into the industry!